Brush the prepared cornet moulds with oil. Wrap 1 strip of puff pastry around each cornet mould, place on a baking tray lined with baking paper with the pastry ends facing down. Brush with egg. Bake each tray for approx. 20 mins. in the centre of an oven preheated to 220°C. Remove from the oven, cool on a cooling rack, remove the cornet moulds. Repeat the process three times with the remaining strips of pastry. Combine the carrots with the cream cheese, whipped cream and horseradish, season with salt. 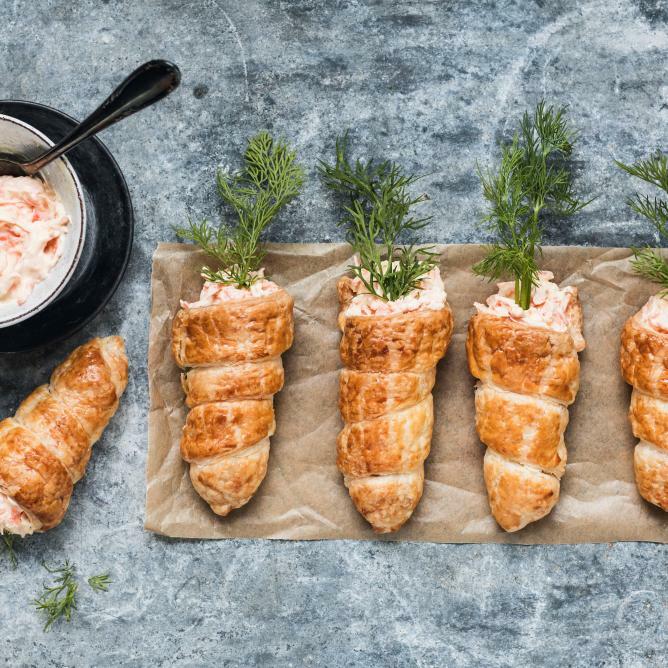 Stuff the puff pastry cornets with the mixture, garnish with a sprig of dill. Home-made cornet moulds: shape cardboard into cornets, cover with foil.